The crest of the Assiniboine River in Brandon could come as early as Friday, provincial flood officials warn. During a Wednesday news conference, Steve Topping of Manitoba Water Stewardship said the crest will hit between April 21 and 24 at 1st Street. That’s almost exactly the same time period as when the river crested in 2009. As for Winnipeg, Topping added it’s “very probable” both the Red and Assiniboine Rivers will crest in Winnipeg at the same time beginning May 2. 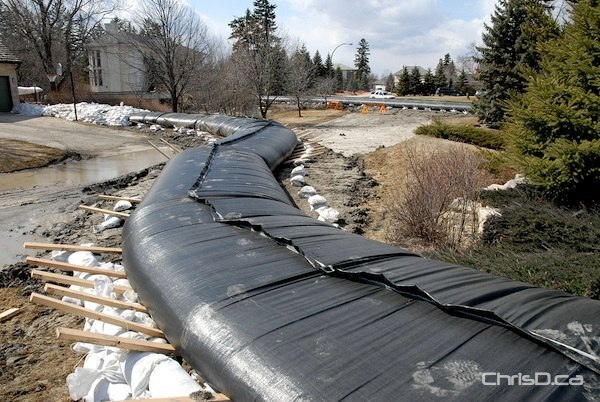 In Melita, construction continues on secondary dikes to hold back high river levels. The Souris River has now crested, with no additional crests in the forecast. The province also noted that the total number of evacuations is now up to 866 people, up by 103 from 24 hours ago. The majority of the evacuations are due to precautionary measures being taken to ensure road access isn’t cut off to people living in rural communities. Gerry Delorme with Manitoba Health stated 42 of those evacuations came from the St. Adolphe Personal Care Home, where residents were moved to Grunthal over fears road access would be jeopardized. The latest flood information can be found at Manitoba.ca/flood.